I’ve worked with Oilatum Junior previously and we love their products; so when they got back in touch with me to run a competition, of course I said yes. Do you want to win a £50 voucher for Boots? Come on, you know you do! 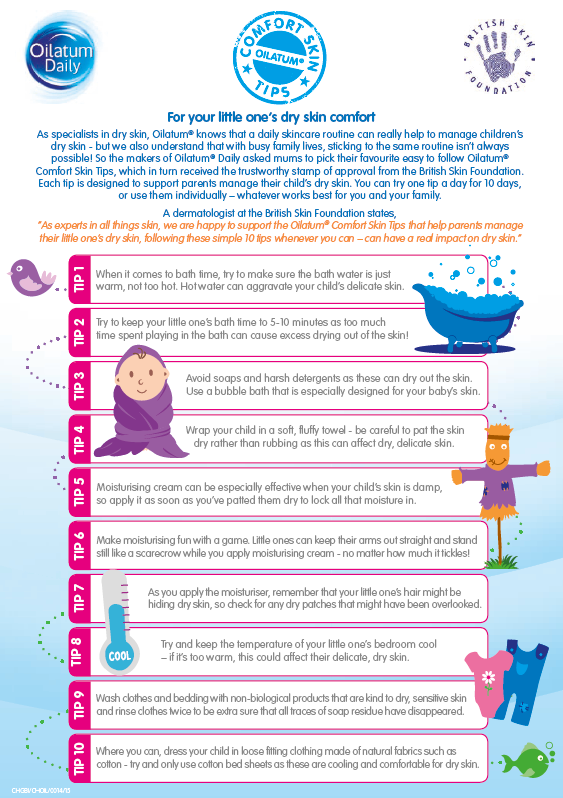 Oilatum Daily are dedicated to helping mums and dads manage their little one’s dry skin needs, and with the help of real parents and The British Skin Foundation, they have collated the following Oilatum® Comfort Skin Tips to try and help manage children’s daily skincare routine. · All entrants must comment on the blog post to be eligible to win; Comments made on Facebook/Twitter links will not be eligible. · If you have commented once the competition has closed, then your comment will not be included. · The winner will be selected by a random number generator to ensure fairness. In the event of the winner not meeting the full criteria, then the draw will be done again until a fully compliant winner is selected. · Competition is open until midnight on Friday August 28th 2015, any comments after this will not be counted. · You must provide a valid email address in the comment form so that you can be contacted. If we can’t contact you then you can’t get your prize. · Competition winner will be notified via email within 1 week of the closing date and will need to provide their postal address in order for the voucher to be posted to them. I love tip 6 – making things fun is what makes all the necessary things easy with kids (Inc toothbrushing!). Number 2 about limiting bath time; I didn’t know that one! I like the scarecrow tip! That’s not something I’d heard of trying before, will have to give that a go with my little boy. I think our tip would to be to make sure they’re hydrated, if little ones don’t drink enough their skin becomes dehydrated. Tip 5 is my favourite tip as we’ve found it very effective in the past. My own tip would be to not only limit the length of their bath times but the amount of baths they have too. Little ones, generally, don’t need a bath every day, it just dries out their skin. Tip 5 is my favourite! I actually didn’t realise that this was the best time to apply moisturiser, but will do in the future! My tip is to let your child rub in their own moisturiser as they get older (with assistance). My little boy loves rubbing his tummy to soak up the cream! Tip 6 Make moisturising fun! Tip 2 is interesting as I didn’t realise there should be a limit to amount of time in the bath. I loved tip number 6, will definitely say time when creaming their skin. I like tip 4, my little one likes being wrapped up in a towel all cosy! I’d add another tip , to avoid heavily perfumed products for little children’s skin as they can aggravate skin conditions. But also tip 4 because I love being wrapped in a big fluffy towel too! Tip 5 is my fave, I thought you had to wait to be 100% dry. Tip two :- keep bath time between 5-10 minutes. So helpful didn’t actually know that. tip 8. Keeping the cool warm. Number 9 is very important, great tip! To add one of my own, I’d say always wash baby & children’s clothes when you buy them before they wear them for the first time. The dye/materials used in certain shops can irritate sensitive skin. Tip 3 – using natural products. Too many nasties out there which damage our skin. Tip 5 and 6! My little ones both have suffered with eczema and moisturising can be a nightmare! Keep it fun! Tip 9 is a great one. I’m a bit obsessive about washing everything before it comes into contact for the first time with my baby’s skin just in case it causes a reaction. An extra rinse is a great way of ensuring that even the gentler washing products don’t cause any nasty itches or dryness. My one tip for newborns under a month is just good old olive oil – our DD came out pretty flaky from being 10 days overdue and the midwife pointed us towards a bottle of Extra Virgin. Worked a treat! I like Tip 6- it’s difficult to get my monkey to stay still! My own tip is: When they are having too much fun in the bath and don’t want to get out, wrap the towel around them like a cape and play superheroes- they’ll be distracted and excited to get out instead of having to be dragged out clinging to the bath taps! Tip 4 is my favourite. My tip is to get in the bath with your child and play ‘Row row row your boat,’ if they are nervous about sitting down. Tip 6 is great- it’s difficult to get my monkey to stay still! My tip is to pretend the towel is a superhero cape- it makes getting out of the bath exciting too, so it’s not a battle to end bath time! Oops, sorry, thought my first comment had been lost! Tip 2 is good – Not to let you little one spend to long in the bath. I would also add that bubble bath is not good for children who are prone to exzema. It is best to have good old bath water as much easier on the skin. I really like tip 6! Tip 9 is my favourite, it’s something I’ve done since my first daughter was born. I also like to make a sort of bath teabag by taking an odd sock and filling it with oats, chamomile and calendula (if I have it), then running the bath water through it. My kids also like to use it as a sort of bath scrunchie/flannel so I make sure I’ve tied a tight knot it the end of it! Tip 5 – Wrapping up in a soft fluffy towel! I’m a sucker for a soft towel and hate line dried crispy towels. Not very economical to tumble dry but soft towels and plenty of moisturiser are great for my little ones excessively dry skin! Avoid soaps and harsh detergents ! My own tip – USE SUNTAN LOTION! The sun can be very drying on the skin. #4. It’s so nice to wrap my daughter up in a big towel to dry her, especially because she loves to cuddle while I do it. I like No.9 the best – My three year old gets really ‘Itsy’ if we wash his clothes or bedding in Bio washing powder and scratches relentlessly! I like tip 2 about keeping bath time short. I also add a little baby oil or coconut oil into the bath water to help moisturise my kids skin. But be careful – it can make the bottom of the bath more slippery. I like Tip Number 6, it sounds like fun! My own tip: You could apply tip number 6 to putting suncream on too! Kids never want to stand still then! Tip 9 as several of us in my family suffer from eczema. Tip 1 is my favorite as I have experienced this! hot water made my little one’s skin itchy! Tip 8 about keeping my boys room cool is very important to me . There is nothing worse than the heat from radiators to make dry skin worse.